DNSLookup is A small DNS Lookup tool for windows, to get the remote host DNS Information by sending a DNS query to your local DNS server. It send a DNS query to your local DNS server regarding the desire Host/Domain/IP, once the DNS server find the requested target it return the target DNS records. 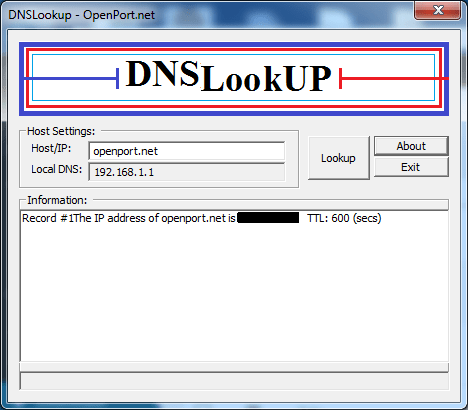 A DNS is a short text for Domain Name Server, a server that can transfer name into a numeric IP address, in simple words, convert IP address into domain name, openport.net turn to be 97.74.215.80 as example. consequential or indirect damages due to loss of data or any other reason.